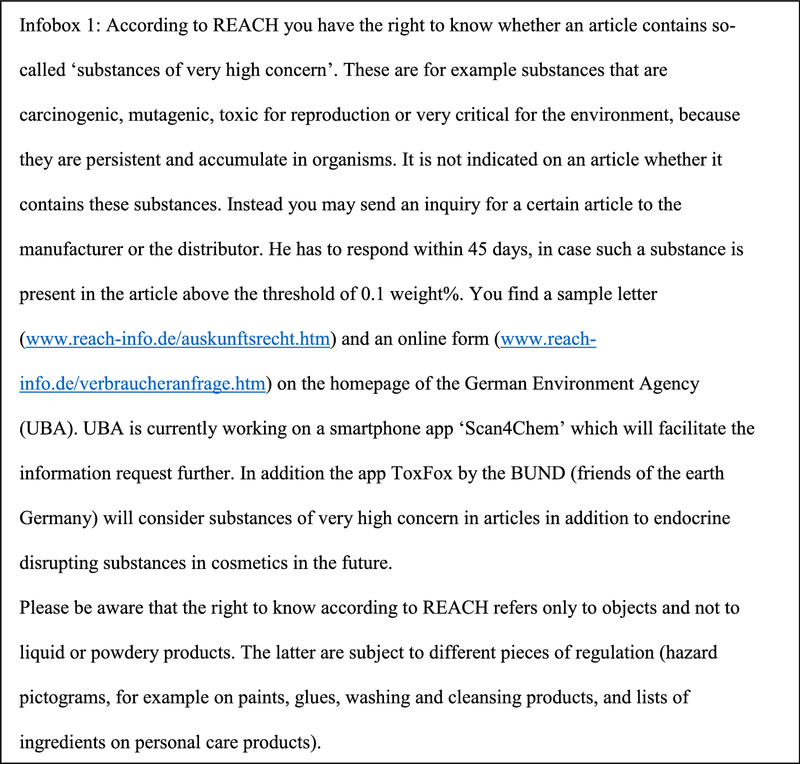 The online version of this article ( https://doi.org/10.1186/s12302-018-0153-1) contains supplementary material, which is available to authorized users. 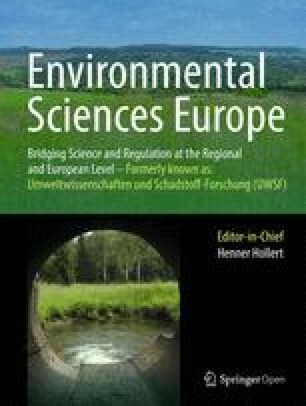 The ‘SVHC right to know’ is a key element on the way to minimize adverse effects for the consumer and the environment caused by harmful chemicals. 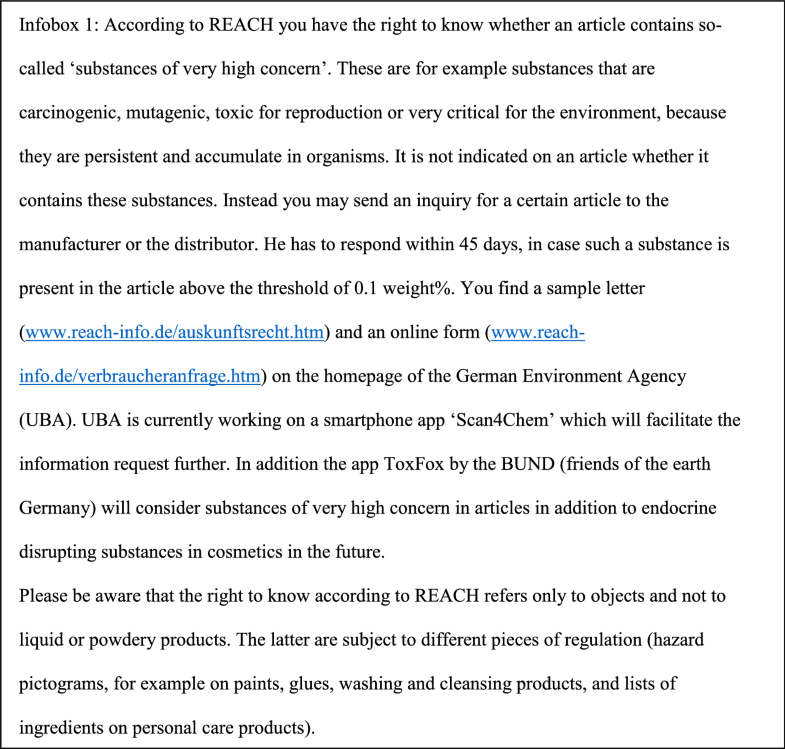 It should increase transparency and awareness on SVHCs in consumer articles, help interested consumers to make informed purchasing decisions, and to ensure a safe use of articles, and it should contribute to a reduced discharge of SVHCs into the environment and support the efforts of producers to substitute SVHCs by less harmful chemicals or non-chemical solutions. There are companies that take great care and answer the requests to the best of their knowledge. However, there are various studies describing that this communication tool is not working as well as intended. 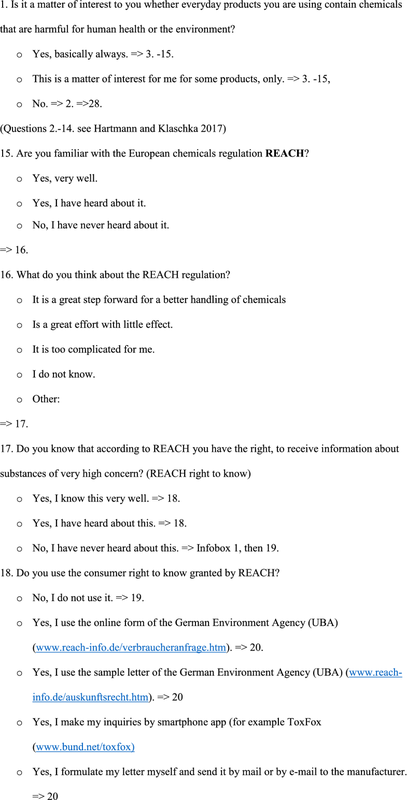 The problems identified are for example, that not all suppliers are aware of their obligation, that the quality of the answers often is not satisfactory, or that consumers receive no answers at all for articles which contain SVHCs above the threshold [5, 6, 7, 8]. Some competent authorities made efforts to support suppliers with their duty to inform [7, 9], whereas the role of the consumers in this risk communication has been neglected so far. This could be one reason why the ‘SVHC right to know’ has still not become very popular, although it has been in force for more than 10 years now. Companies that take their responsibility seriously, comply with their information duty and eliminate SVHCs in all their articles are better prepared for upcoming restrictions and authorisation requirements can build trust in consumers and thus can profit from the resulting competitive advantage. However, the REACH regulatory fitness and performance programme evaluation (REACH REFIT) revealed that some retailers perceive their efforts to be well prepared for SVHC consumer requests as superfluous, as the interest by consumers for such information remains low . 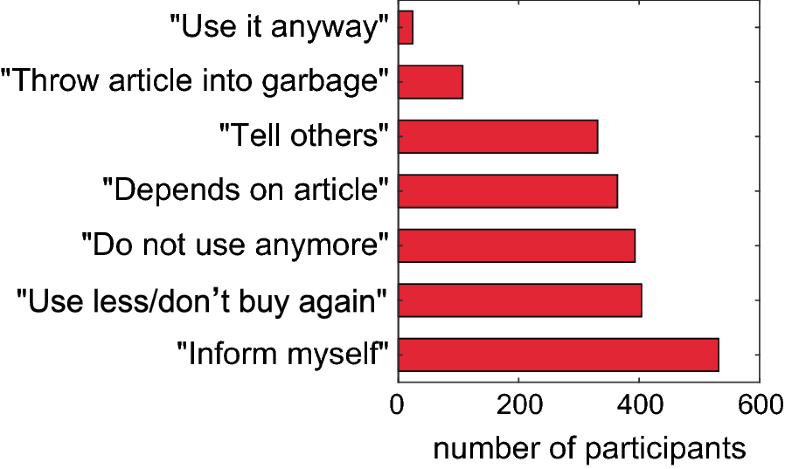 Several results of our survey make it understandable, why many suppliers are reluctant to inform about SVHCs in their articles [5, 6, 7, 8]: only a minority of all consumers would buy SVHC-containing articles with no strings attached (Question 25) and there were even consumers who regard the presence of an SVHC in an article as reason to return it to the retailer (Question 26). 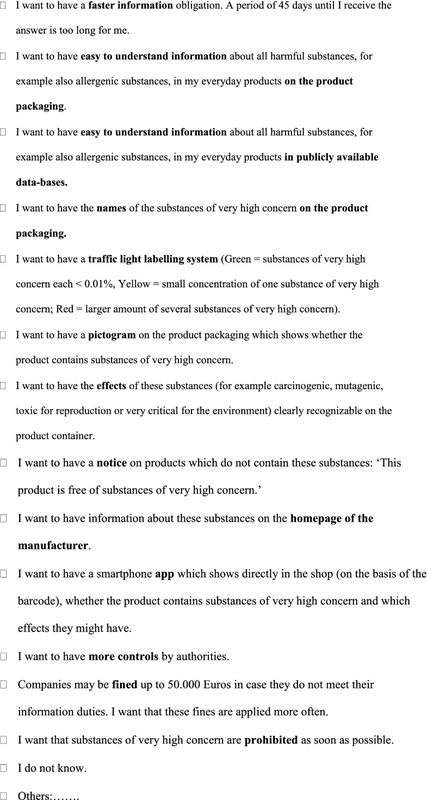 However, as long as only 4% of the highly motivated and interested participants make the SVHC inquiries (Question 18, 19), the pressure applied by the consumers’ request to suppliers remains probably lower than other stimuli to substitute SVHCs in articles, such as the sun set date and the authorisation requirement according to REACH Art. 56, 58. Additional file 1: Figure S1. 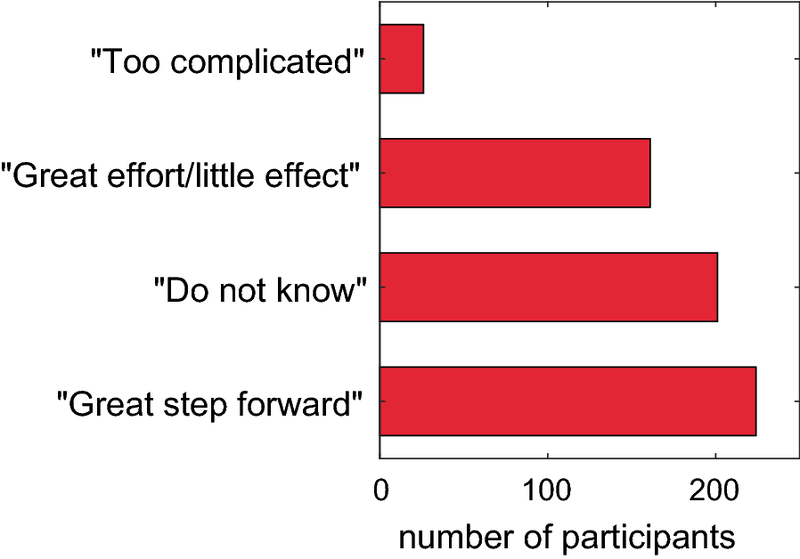 Age groups of study participants and self-reported knowledge in chemistry. 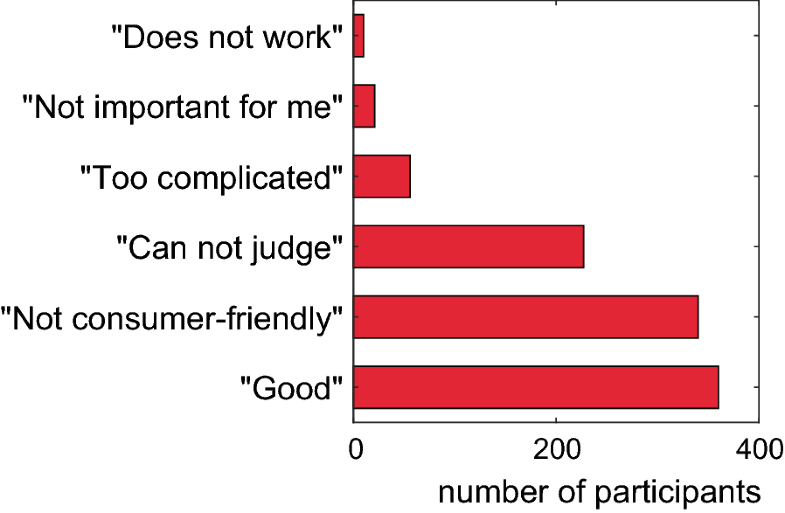 Diagram shows the proportions of female (left) and male (right) study participants who have (very) good self-reported chemical knowledge. Additional file 2: Figure S2. Flowchart of the questionnaire with number of participants. Numbers decline from 1321 to 1030 as 291 participants ceased answering the questionnaire before the end. Additional file 3. 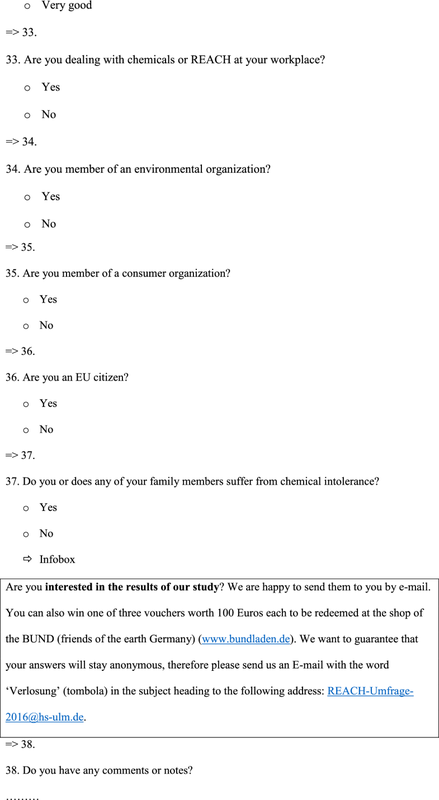 Original German version of the survey.